I’ve finally had a lot of time to work with the the iPad Pro over the holidays so I thought I’d write a quick review of my first impressions using it. I’m really impressed with the sleekness of the Pro. It’s so much easier to hold and to work with than I anticipated it would be. My iPad usage is focused primarily on productivity. I use iPads almost exclusively, so having a few backups is mandatory. We rarely let go of one, so it was almost unprecedented that we gave away the 2nd iPad we owned, which was a 2nd generation, just a few months ago. It was quite heavy relative to the newer Air’s so the extra weight is still ‘recently familiar’ for me. The Pro feels quite comparable to me in terms of weight…yet oddly, it doesn’t feel as though it’s that heavy! Perhaps it’s due to the dimensional differences, but this iPad almost feels lighter to me than that original 2nd gen. Maybe it’s because it’s so thin? It definitely has a sleek feeling to it. It just feels really nice to hold in either landscape or portrait position. It’s not at all fatigueing in that regard. I used the Pro for almost the entire day one recent Saturday and I did a lot of writing on it. Fatigue could easily have become a factor but it wasn’t. So overall I’d say this was a pleasant and welcome surprise…because I did secretly fear that it would just be too big and cumbersome. So I learned that I don’t always understand my needs all that well. I was secretly worried that the Pro would be a HUGE mistake for me…but it’s not! All 3 aspects are amazing! This iPad is truly built for media consumption! I queued up several 4k videos for my husband to watch but he never got around to it because he was so impressed with how his own photos looked! He’s an extremely avid amateur photographer thus not easily impressed…but he was with this display. I didn’t think much about the sound experience until I used it for ‘Reading Out Loud’ some articles I found online…the volume was almost too loud! I had to turn the volume down to one of the lowest settings in order to not have it blare throughout our entire house! So overall I’d say both sound and screen resolution are really impressive. Another thing I should mention here is that I’m pretty blind…so I usually keep the display brightness set pretty high. Happily this didn’t seem to burn through battery reserves any faster…the battery seems to be well-sized and calibrated for the extra power. While I didn’t get the full 10 hours predicted time…I’d say I got a solid 8 hours of extremely heavy use…I am a very heavy user…so I rarely manage to get the full amount of time promised for battery performance. The keyboard and typing are, for me, really problematic. Apple redesigned the onscreen keyboard for the Pro. While I appreciate the changes they’ve made they really don’t work for me at all. Thus typing was not a great experience for me. I use iPads almost exclusively for all my word processing needs. I really like typing on ‘virtual’ or ‘onscreen’ keyboards. 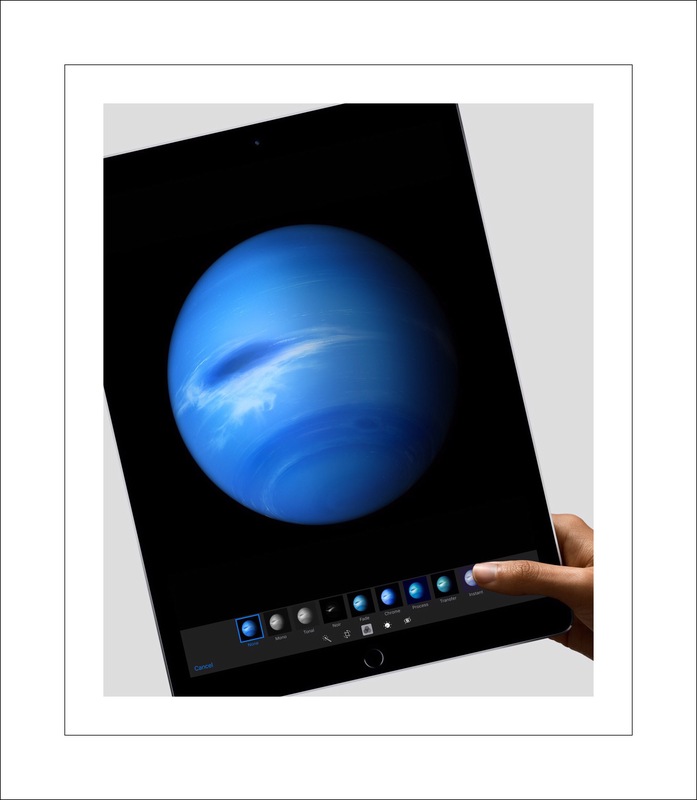 The iPad Pro has an expanded the onscreen keyboard compared say to the iPad Air 2-2’s in an attempt to offer the kind of full featured keyboard that you’d find on a laptop. Maybe because I do type a lot these changes bother me more than most users. I was really hoping that with a little more time and usage that I’d get used to the new keyboard. But sadly, I don’t think that will happen. In the end there were several consistent problems that just didn’t go away with longer usage. In fact I ‘typed’ this post using the Pro. But then when I got to the editing phase of things I realized there were even more problems than I’d originally realized there were. So the on screen keyboard, for me, is where the iPad Pro is hugely lacking. See below for a link to my post about the iPad Pro keyboard’s default key arrangements being qwertz versus qwerty. The first problem I encountered using the onscreen keyboard was that my left hand kept accidentally tapping onto the key that opens the emoji characters. The extra keystrokes involved to open Emoijis and then close them again both wasted valuable time and disrupted my train of thought a lot. The second aspect of the keyboard that I found extremely frustrating was something I’ve not been able to determine the exact cause of yet. Twice, as I neared the completion of this piece, I touched something with my right hand that caused the WordPress ios app to prematurely submit all of the changes that I’d typed in up to that point before I was really ready to submit them. Oddly, not everything was submitted for publishing! The first time time this happened about 8 of the newest paragraphs I’d just entered were completely gone and I had to spend a lot of time trying to recreate them again. I tried going to the WordPress.com online editor but they hadn’t been saved at all! About an hour later when I finally managed to reconstruct that content again, the exact same thing happened…again. I was really extremely frustrated at this point! And that’s the primary reason this post is first being published on New Year’s Day. One last extremely annoying situation which can be seen in the top screenshot above is that on my onscreen keyboard the locations of the ‘z’ key and the ‘y’ key have been switched. I’ve not yet been able to discover why this is and how I might be able to fix it. I suspect it has something to do with the input language that’s been chosen in Settings – Input…at least I’ve read things suggesting that might be where the switching problem emmates from. Apparently in some countries the switched layout is the norm. But for me it causes a lot of typos…basically every time I to input a ‘y’ or a ‘z’ I either type the incorrect letter or I have to stop and hunt for the correct one, which causes me to sometimes lose my train of thought. My normal workflow is usually to use Siri to ‘Read it Out Loud’ to me after I’ve visually proofread a post because I’ve found that’s a really good way to proofread. Using the iPad Pro I found a ton of extra errors through this process…many more than I’d have found using my regular Air 2. Many of them I never noticed visually proofreading because all the errors were same type. I’d inadvertently mistyped several word’s which included the letter o with the number 0 instead. The 0 (zero) key is immediately above the o (letter) key. But the keyboard spacing between the rows is sort of shallow, so I guess I hit the 0 (zero key) way more often than I realized. The only way to find these errors easily is by using Siri because the o’s resemble the zeros so much that you can’t really tell the difference visually. Disclaimer: I’ve typed this entire post using the iPad Pro…which , given my problems with the onscreen keyboard has been a real feat! Sadly, every time I have occasion to come back and retread this I find a ton of typos I missed during the many edits needed because the onscreen keyboard is so awful (for me.) So please excuse the typos if you run across more of them…if nothing else they are a testament to how poorly I type using the iPad Pro! In another article 9to5mac discusses why the larger size of the Pro’s onscreen keyboard causes fatigue. They also have been underwhelmed by all of the keyboard accessories they tested to date. 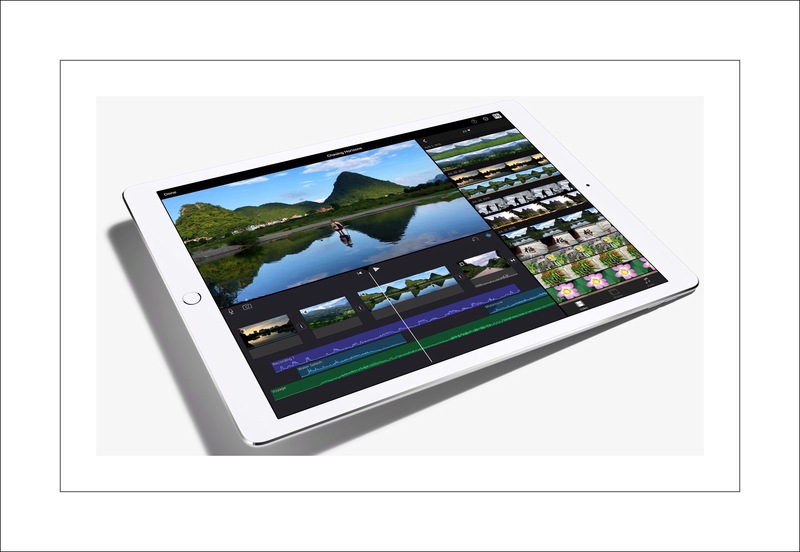 9 to 5 Mac’s Is the iPad Pro Really Ready for 4K Video Editing? This entry was posted in Apple News, Apple Products, ios 9, iPad, iPad Pro, Tech Tips and tagged iPad Pro, iPad Pro Problems, iPad Pro Review. Bookmark the permalink. where I tried to cover all the announcements, so I haven’t really look at a side-by-side comparison yet. Which was really my main reason for even watching the event! I got the Pro for my husband who was running out of storage on his 64GB Air. But he just doesn’t use it. He cleaned up his Air and has about 7 GB’s now. I like so many aspects of the Pro but I write a lot and I just haven’t found a fast enough way to do that with the Pro. Consequently I just never use it. I’m wondering which onscreen keyboard the 12″ has. I’m thinking that I may get that one and ditch the Pro. Adam’s observation that autocorrection was off has definitely helped me. I was certain it was on…but I’d messed with that keyboard so much that I must have turned it off and not really realized it. Even with it on however, my typing just isn’t very accurate…it takes longer for me to type things and more time to correct versus an Air. Part of that time difference is due to inherent design problems like the o and 0 key being very close the each other and being indistinguishable when proofreading. But I haven’t heard anyone else have the magnitude of problems with that that I’ve experienced…so it may just be my way of typing, the size of my hands, etc. But a much bigger part of I think is I’m just so used to the keyboard layout of the Air. At one point I think I found a way to put the regular Air keyboard onto the Pro…but quickly realized that it was awful on a 12″ tablet. The keys looked stretched out and they were hard for my fingers to reach because they stretched across the whole 12″s…so that wasn’t a solution either. It’s possible that it’s just a learning curve issue now that I’m not entirely sure I’m willing to take because I have 3 Airs. Your spec comparison is surprising and helpful! I need to look at those in more detail. I’m going out of town tomorrow but before I do I’ll try to use the Pro’s keyboard once more for some concentrated writing and see how it is now. But I haven’t installed 9.3 yet. Thank you for your insight! I’ll post another reply here hopefully if I get that done today. OK, I’ve had more time to test out the Pro’s keyboard and I’m typing this reply using it. I think that with time I’d grow accustomed to it and could be pretty fast with it. It feels a little stretched out for my smaller hands but that too I’d probably grow accustomed to. I’m just really used to the Air’s keyboards and I’m still faster with that one because some of the keys are in different places on the Pro. But after rereading Adam’s post again I appreciate the changes more and I think that if it was my only tablet I’d probably end up being able to type faster because of the changes. Not having to swipe up for the ‘ for example does save time! But constantly switching back and forth between the two wouldn’t be great. And right now I have 3 Airs…so I guess I’ll never end up using the Pro much for typing…but it’s great for other things. Like watching videos. And doing split screen stuff. There are 2 other infrequent problems that I have with the Pro’s virtual keyboard that others have mentioned encountering also. The first is that I sometimes inadvertently hit the key in the lower left corner that pulls up the emoji keyboard. It’s annoying because it breaks my concentration and rythm to have to close it. The second thing is that sometimes. like right now, when I’m typing the Pro doesn’t ‘advance the paper’ as I’m typing so that I can see what I’m typing. I have to stop typing occasionally and use my finger to slide the screen up so that I can see the current line that I’m typing. Otherwise what I’m typing ends up being underneath the keyboard. It’s got to be a software bug. So, while typing this I inadvertently opened the emoji keyboard 4 times, and I had to stop typing to ‘advance the paper’ about every three to 4 lines. Can you tell that I learned to type on real typewriters? I hope this helps some! Please let me know when you get your Pro how you like typing on it…I’d really love to know!